Our thai pupils are back to school! 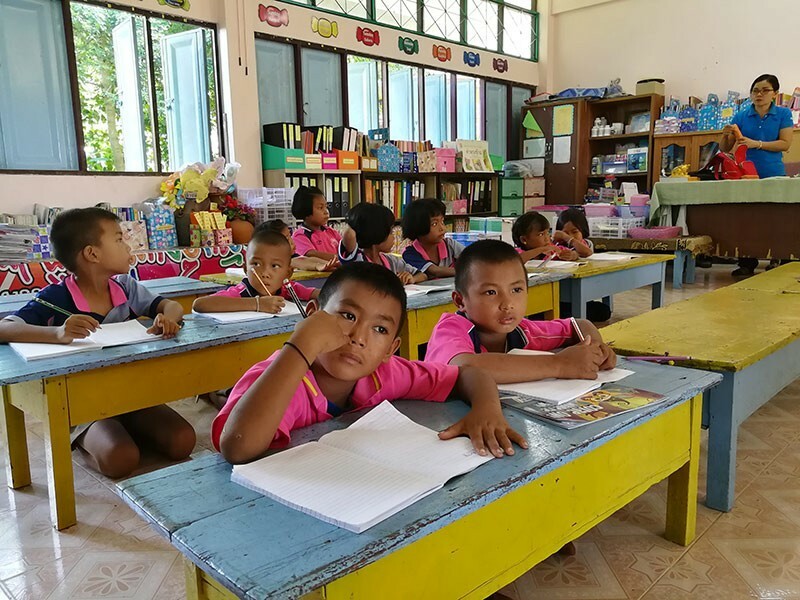 In the rural province of Buriram, the 57 partner schools of La Chaîne de l’Espoir reopened on 16 May 2018 for the start of the new school year. In Thailand, the start of school is a solemn occasion. After the flag-hoisting ceremony, the school principal addresses a welcome speech to all the attending pupils and teachers. Children are proud to wear their new uniforms (with teenage girls paying special attention to their appearance!) and all receive school equipment to commence this new year of hard work under the most favourable conditions. All children (or rather almost all of them!) actively participate in the thorough spring cleanup. After two long holiday months, the youngest ones quickly swap the broom for a ball and happily join their friends around swings, slides and turnstile roundabouts. In the Ban Butasum primary school, a religious ceremony, called baci soukhouan, was even organised to congratulate Thip, a young student from the Thammasat University in Bangkok, who spent six months training with managers from La Chaîne de l’Espoir. During her internship, a school library was created with the precious help of villagers and the support of local partner companies. Here are a few photographs of this 2018 back-to-school session, full of smiles and optimism. We hope that this year will be a successful one for all schoolchildren and for La Chaîne de l’Espoir, who, thanks to your donations, will continue to develop and strengthen its socio-educational and school health projects dedicated to the welfare and personal development of the children of the Isan region.